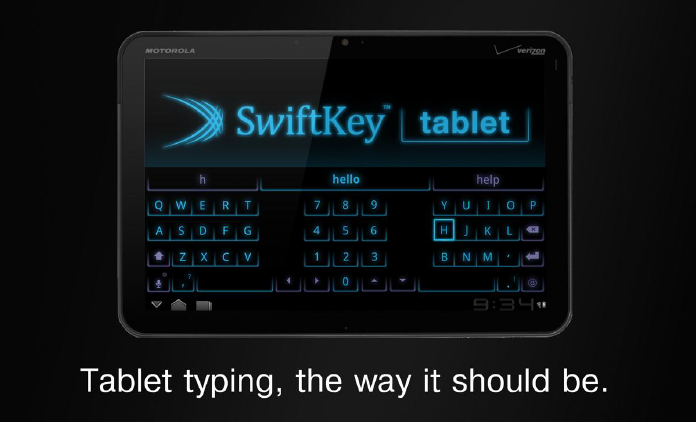 We can't say we didn't see it coming, considering we saw this preview of the tablet-optimized SwiftKey keyboard during CES, but what SwiftKey is announcing today looks quite a bit different, to say the least. Allow me to introduce Swiftkey Tablet - a tablet-only Honeycomb keyboard set to launch around the same time as the Motorola XOOM tablet. Sticking with the 3-way-split design, the new holographic look reminds me quite a bit of Tron. If you watch the video below, you'll see that the UI is quite... magical, with suggestions floating up when clicked. The dual space bar design and the presence of arrow keys are very welcomed as well. I think my new tablet is going to like this quite a bit. What about yours? MOUNTAIN VIEW, CA — A new app designed to offer a major productivity boost to typing on tablet devices, SwiftKey Tablet™, was unveiled Wednesday at Google's global headquarters in California. The app, created by developers TouchType, has been designed in partnership with Google and Motorola to coincide with the launch of the world's first Android™ Honeycomb tablet, the Motorola Xoom™. It makes typing on tablet devices easier and faster by offering intelligent next-word prediction that is personalized to your writing style. The app, powered by TouchType's patent-pending Fluency Prediction Engine, employs a holographic thumb-optimized keyboard skin, designed specifically for Android Honeycomb. This marriage of elegant design with incredible back-end power gives users a novel, exciting and fast way to type on a Honeycomb tablet. TouchType co-founder and CTO, Dr Ben Medlock, said: "SwiftKey Tablet™ has all the power of our next generation Fluency™ prediction engine, integrated with a completely redesigned interface, optimized for Honeycomb." "To look at, this is a really exciting product - and once you try it, you’ll be blown away. We've worked closely with Google to make sure SwiftKey Tablet™ utilizes the power and flexibility of the new Honeycomb OS, and we believe that it really enhances the experience."